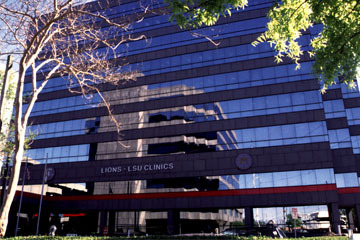 The Learning Center is located on the 5th and 6th floors of the Lions Building at the Downtown campus of the LSU School of Medicine. The campus is conveniently located next door to the LSU Interim Hospital (formerly University Hospital), and is only a short drive away from other major hospitals in the city. Take I-10 East towards New Orleans. Take the Poydras Street exit towards the Superdome (exit #234B). Continue on Poydras Street, and then make a U-turn at South Claiborne Avenue in order to go the opposite direction on Poydras. The second street on your right will be Bolivar Street. Take a right at that corner, go two and a half blocks, and you will see the Library building on the left side of the road. Take I-10 West towards New Orleans. Take the Canal Street exit towards the Superdome (exit #235B). Turn right onto Cleveland Avenue. Continue on Cleveland Avenue, and then take a right onto South Claiborne Avenue. From Claiborne, take a right onto Gravier Street. From Gravier, go three blocks up to take a right onto Bolivar Street. You will see the Library building on the left side of the road. Take the Westbank Expressway (US Hwy 90 East) across the Mississippi River Bridge towards New Orleans. Take the US Hwy 90 East/Claiborne Avenue exit, which will place you down on South Claiborne Avenue. From Claiborne, you need to take a left onto Gravier Street; unfortunately, a left turn is prohibited at this intersection. Go to the next intersection and make a U-turn. Take a right onto Gravier. From Gravier, go three blocks up to take a right onto Bolivar Street. You will see the Library building on the left side of the road. Situated on the Mississippi River 40 miles from the Gulf of Mexico, New Orleans is a unique city bursting with history, culture, and opportunity. Though Hurricanes Katrina and Rita dealt a devastating blow to the Gulf Coast region and its healthcare infrastructure in 2005, the city of New Orleans is on the rebound. Newly opened businesses continue to flourish and tremendous opportunity awaits those who participate in the recovery effort. Federal, state, and local officials are working together to build brand new healthcare facilities, ensuring the city’s continued status as a regional magnet for medical treatment and research. In the interim, a number of local hospitals and clinics have re-opened to provide patient care and teaching services. The city’s natural beauty as well as its musical and architectural heritage have been marveled over for centuries. As a cultural destination, New Orleans is unparalleled. Our famous food, nightlife, and hospitality are internationally renowned. Events like Mardi Gras and Jazz Fest bring visitors from around the globe. Other cultural offerings include the Aquarium of the Americas, Audubon Zoological Gardens, New Orleans Philharmonic Orchestra, New Orleans Opera and the Essence Festival. The region is famous as a sportsman’s paradise with limitless recreational opportunities. New Orleans also hosts the Saints and Hornets professional sports teams, and the Zephyrs Triple-A baseball team.